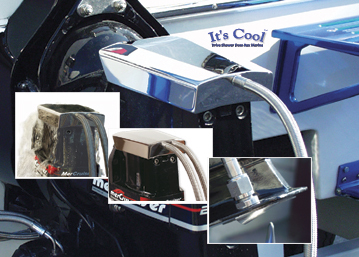 Our Drive Showers spray a continuous cooling stream of water onto the top bearing cap and in the case of the new It's Cool™ model, also the sides of Mercruiser Sterndrives. Tests have shown this extra cooling can double the bearing life and service life of your drive oil and prevents oil foaming, the prime cause of oil breakdown that leads to drive failure. 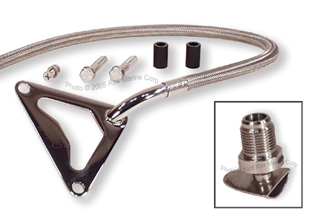 The Drive Shower is a simple device that simply picks up water from the drive cavitation plate when the boat is underway, passing it through the tube or hose, and discharging it onto the top of the drive bearing cap. Simple, yet highly effective in preventing premature wear and failure, particularly in high performance applications where demands on the drives are pushed to the limit. Drive Showers come complete with all attachment hardware. 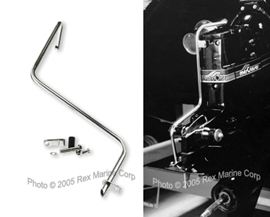 Rigid models are made out of high quality stainless steel tubing. Flexible models, required when using external hydraulic steering, utilize a Stainless Teflon-lined braided hose, instead of the rigid tubing, for steering clearance.